With the Internet making it possible for practically anyone to share their opinions via blogs, websites, and social media, you might think there's no place in the world anymore for homemade printed fanzines. And yet, there are still those dedicated souls who see the value in creating something tangible. People like Clevelanders Edward Mishic, publisher of Crimson Screens, and Mike Salamone, publisher of Bloodfeast, Inc. As you might guess from the titles, both fanzines deal with horror and exploitation movies, an area of film fandom that I have a great deal of love for myself, but don't often get the chance to focus on here at the Cleveland Movie Blog. I recently interviewed both Ed and Mike about their zines, and why they prefer print to pixels, and here's what they had to say. CLEVELAND MOVIE BLOG: Describe your zines for me. EDWARD MISHIC: Crimson Screens is a hand made, photo copied, fanzine that covers horror, exploitation and action movies. Sometimes I wander into other genres, but those three are what I love most. Each issue is written by me, with occasional contributors, and done in the 'cut-n-paste' style that was popularized in the 80's. I love it when you can tell that someone took the time to cut everything apart and paste the layouts together. There's nothing I hate more than a slick, computer layout. Each issue has reviews, commentary and nostalgia pieces. I do miss the days of the VHS rental store, so there is a lot about that. I keep away from printing news because that is outdated an hour after you write it and is a waste of space. Some issues have a theme. There was a bigfoot themed issue and an 80's action movie issue. Oddly enough, the 80's action movie issue is the most popular issue and I still get requests for that over a year after it came out. I don't really cover DVD extras or picture quality. I cover the movies themselves, and what makes them good or bad. I try to limit the amount of pictures in each issues since, if I was reading it, I would want more to read than to look at. 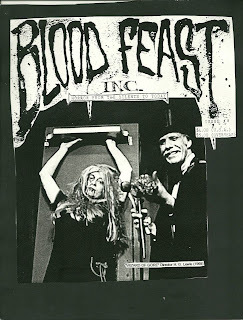 MIKE SALAMONE: Bloodfeast, Inc. covers horror from the silents to today. It deals with every aspect of the horror genre, from comics to soundtracks, directors, spfx artists, anything. I also cover underground metal and punk music. Back in the day I wrote 99-100% of each issue, but now I have contributors including a regular staff member, Lucifer Fulci, who fits in so perfectly it's utterly incredible. I have also had some photographers contribute storyboards with hot models I call the "Bloodfeast Babes". While this might not be a regular feature, we will print them as we receive them. The "Food For Thought" column in the zine used to be for political rantings. Since the zine returned it has broadened it's horizons to be on various topics. I feel since I've done political radio for close to 15 years now, the last thing I want to write about is politics. So far each new issue has had a show promoting the zine featuring metal and punk bands, movies on the big screen, and even Grand Guignol Burlesque. As long as I can keep some sort of schedule on putting issues out I will, and as long as bands and such want to support the zine, I'll keep doing shows. It's great publicity for the performers and the zine. CMB: These days everyone is blogging, and more and more print magazines are ceasing publication. Why buck the trend? EM: Because anyone can sit down, go to blogger.com and, 20 minutes later, have a website. I don't hate websites, but it's just not what I chose to do. I miss going to stores and buying zines. While there are many quality websites, nothing beats having an actual zine in your hand. It's something that someone took the time to write, put together and get to you. I suppose the websites are actually doing the same thing, digitally, but I prefer the printed product and that is why Crimson Screens is made that way. There are a lot of people who have written to me to express how they appreciate the fact that there is a zine that can be read, collected and/or kept. I guess making a website is easier and allows more more frequent updates, but 97% of those websites lack the heart that can be found in a D.I.Y. publication. MS: I do Bloodfeast, Inc.to keep the old school alive. You actually have to have it in your hands and read it which also makes it collectible. I feel people are becoming too desensitized staring at a screen, and reading something in print is more of a personal experience, more meaningful. My wife passed away in 2010 and I was thinking of things to keep my mind occupied to try and ease the pain. I thought of doing a zine and figured if I brought BFI back I already had a logo and a mission so that would be perfect. So far it seems more popular now than back in the day. CMB: How did you guys become interested in these kind of movies? EM: As a kid, I would spend weekend afternoons watching Godzilla movies. It didn't take long to find all the other monster related movies that used to fill Saturday afternoon/night television. TV was very different then. It's very dull now. Now it's, "23425423432 episodes of Law and Order in a row!" or "LORD OF THE RINGS- three times in three days!". It used to be the Spookies into a Michael Dudikoff actioner and then a FRIDAY THE 13TH movie. One night, I remember, was THE THING into DAY OF THE ANIMALS into VICE ACADEMY and its first sequel. So say I liked Michael Dudikoff in AVENGING FORCE. I would go to the library, look up his name in the back of one of the old movie review guides, write down every movie he was in and then go and rent them all. It worked that way for so many actors and directors. The video rental store contributed to my interests because they were palaces of unseen goods. As a younger kid, I would rent by cover, meaning I would rent whichever movies had the coolest cover art. I would also look in the back on the TV channel guides that came in the newspaper and read all the movie descriptions. I must have watched dozens of movies based off a one or two sentence description. Soon enough, I discovered zines through a local comic book store. They carried all the cool ones, and most importantly, kept the section stocked with as many new issues as possible. At that point, there was no turning back and I was hooked. MS: I always loved horror films as a kid. It could be broad daylight and i would be too petrified to move. Yet every week I'd scour the TV Guide and circle every horror film that was on that week. I'd even get up at 3 or 4 in the morning and watch something like Tobe Hooper's FUNHOUSE or CHILDREN SHOULDN'T PLAY WITH DEAD THINGS which would really put me in a state of sheer terror. But I still always watched them and loved every minute of it. When there was a horror host on they would hold my hand until THE WOLF MAN or INVASION OF THE SAUCERMEN would return and scare the crap out of me again. Those were good times! CMB: Both of you seem to have a preference for older (eighties or earlier) stuff. Why? And are there any newer films and filmmakers that measure up? EM: I prefer those titles because that's what I grew up watching. Those titles are more exciting and have more of what I like in a movie. What made those movies great was that the filmmakers were just making a movie. Now, everyone tries to copy the 70's or 80's feel and so it comes across as a weak imitation of something way better. Also, the time and effort that went into effects and creatures is sorely lacking now. CGI is used and abused to the point where it instantly cheapens a genre title. I'll watch everything though, and everything gets a faIR shot. Sometimes I'm surprised, but most often, I'm not. A newer director who I think is worth following would be Alexander Aja. There are good newer films though, MARTYRS, THE WOMAN IN BLACK, INSIDE, A LONELY PLACE TO DIE, even CHRONICLE. The LAID TO REST series is an enjoyable throwback to the 80's slasher movies but not in the 'hey look at us! we are making a slasher movie!' style that I hate. Also, I'm always finding old movies that I haven't seen yet, and I'll never pass up the chance to check those out as well. MS: I feature newer films, but yes, a lot of older stuff. I don't want anyone to forget Lon Chaney Sr. or Karloff, ya know. While I've seen some good horror movies come out in recent years, there seems to be a trend where everything happens so fast you don't even know what's going on. Let alone what the monster looks like. It's like the editor is on camera rather than the director and actors. I like Eli Roth a lot. CMB: Are there any other zines or writers in particular who made you want to do a zine of your own? EM: I made music zines long before I started Crimson Screens. I never played any instruments or anything so my way to be involved beyond being a spectator was to write about it and make zines. That desire to make something came from reading Suburban Voice, MRR and countless others. Eventually, I applied it to my interest in movies. My favorite movie zine was Rick Sullivan's Gore Gazette. I always thought he was the most honest and foul mouthed, and you could be sure that if he said something was a piece of crap, then it was probably a piece of crap. You could count on 'zines to give you the truth. Most of them had no corporate backing or sponsorship, so they had nothing to lose by telling the truth. Slimetime and Shock Cinema were a big influence. Videooze. Sleazoid Express. European Trash Cinema. There were a lot. Psychotronic and Deep Red too, even thought I consider those magazines more than zines, but either way, still a huge influence. They were all an influence in one way or another seeing as how they helped me realize that anyone, with a little self motivation, could write and publish something that others would want to read. There are new zines too, that I read and they keep me motivated to keep putting out issues. Blood Feast, Inc., Lunchmeant, Ultraviolent, and Shock Cinema all still push me to keep writing and getting new issues out. 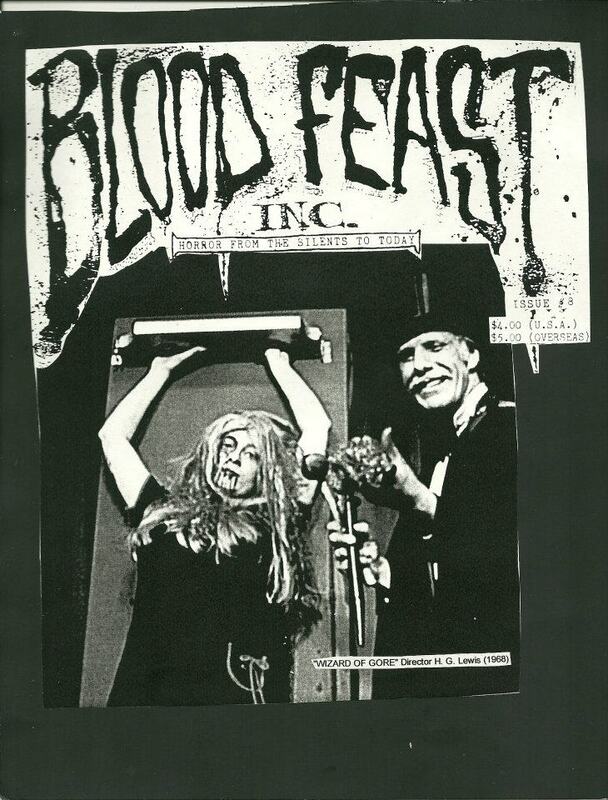 MS: I started doing Bloodfeast, Inc. originally just because I love horror and wanted to share that with others. I soon found out there were others like me doing zines like Shaun and Blackest Heart, Chas. Balun and Deep Red. I see the underground scene is still alive and well. Liquid Cheese is a really great zine for fans of Horror and exploitation. CMB: Any other projects you're working on or involved in? EM: Well, I am currently working one two other things. The first is a book about old Cleveland area video stores and theaters. I am also working on a novel, which has nothing to do with movies, but could easily be the plot of a movie I would watch. Also, if I was not writing a movie zine, I would resurrect one of my music zines and put out new issues of that. It would take some effort, though, because I'm way out of the loop with that. It would be worth it though, because I met a lot of cool people through those zines. MS: When I originally stopped doing Bloodfeast after eleven issues, I got into politics and got into radio, which I'm still doing 15 years later (Mike hosts the Domestic Terrorism radio show on WRUW, currently airing on Wednesdays from 12:30 pm to 3:30 pm). CMB: How can people get your zine? EM: I copy and distribute the issues myself. I have a huge mailing list of people who receive each issue. I also leave some around town, but I'm very selective about that since I don't want them on the floors of peoples cars, forgotten about, right next to the most recent issue of Scene. If you want to be added to the mailing list and get new issues for free, just send your information by email to crimsonscreens@gmail.com. Don't put Bloodfeast Inc. cuz then I can't cash them. You can also find us on facebook at https://www.facebook.com/Bloodfeastinc.